I like it, now that I am getting used to it. Change happens far too often for most of us. The two main reasons for upgrades are to fix bugs and to provide more functionality. Fixing bugs can mean making the OS more secure and running smoother. Providing functionality incorporates advances in hardware, like touchscreens, faster and larger memory, and integration with the Cloud. I first installed a pre-release (beta) Windows 8 on a Dell laptop from Vista days. I sort of knew what to expect because I did my research. The big thing everyone was talking about was that the Start button was gone! 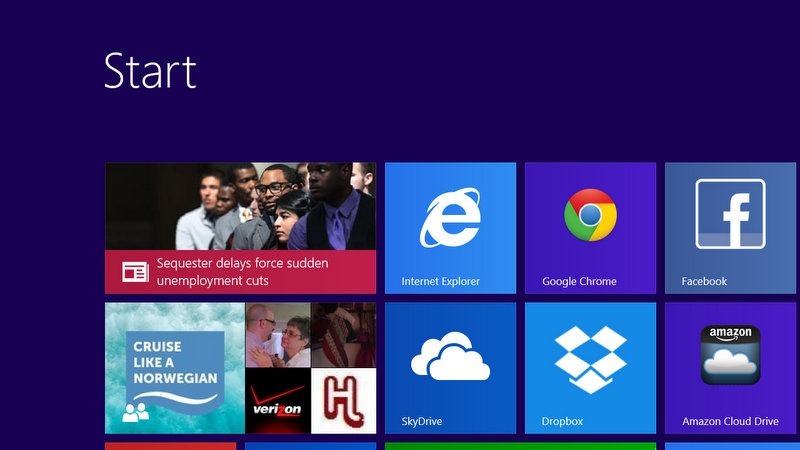 There was a new screen, called the Start Screen, full of tiles or rectangles that updated constantly. The old desktop screen was still there, too. What do I do? Relax. It is still Windows. And if you want, clever programmers have devised ways to make the new User Interface look just like the old User Interface. I choose to learn and work with the new stuff. It really is a better way for me. Listen to our current Gabbing with the Geeks episode to hear Jim and Chris talk about Windows 8 and the Start screen. I have learned that the borders and corners of the screen are hiding all the answers and features. Move your mouse curser to the lower left corner of the screen, and you will see the new Start icon. Click it and the Live Tiles Start Screen is visible. This IS your Start! You can arrange the tiles into a logical order for you. You can create tiles for almost anything. They are your shortcuts to the programs. It is really much better than the old start menu and desktop icons once you get used to it. You can also just start typing at the Start screen to search for a program. You can get to the Start screen any time by pressing the “Windows” key on the keyboard. There is a special “Charms” menu hiding on the right side of the screen. One way to access it by moving your mouse cursor to the bottom right corner and then up. The charms are always available. The first charm is Search. It is very powerful and context sensitive. You can search for anything, anywhere. The bottom charm is Settings. Here is where you can power off or restart the computer. Microsoft introduced with two different operating systems with the same name. One, Windows 8 RT, would be cheaper and run on tablets, much like Android or iPad. It would run apps from Microsoft, but it would not run my older Windows programs. That might be enough for lots of users. Windows 8 Pro runs on “real” computers. Laptops and desktops. And, Microsoft was coming out with a tablet that would run all my old programs and lots of new apps specific to a touch screen computer. That is the Surface Pro. It is available in two configurations. One with a 64GB solid state hard drive, and one with a 128GB SSD. You can add more memory using micro SD cards or USB hard drives, but it is intended to make use of Sky Drive in the cloud. I really like the way I have set up my workstation in my mobile office. The whole computer unit is behind the 10.6” HD touch screen. I plug a 22” video monitor in as my working monitor, and use the smaller screen as my second monitor. A USB hub connects a standard keyboard, mouse and local printer, and I can add other peripherals and drives as needed. 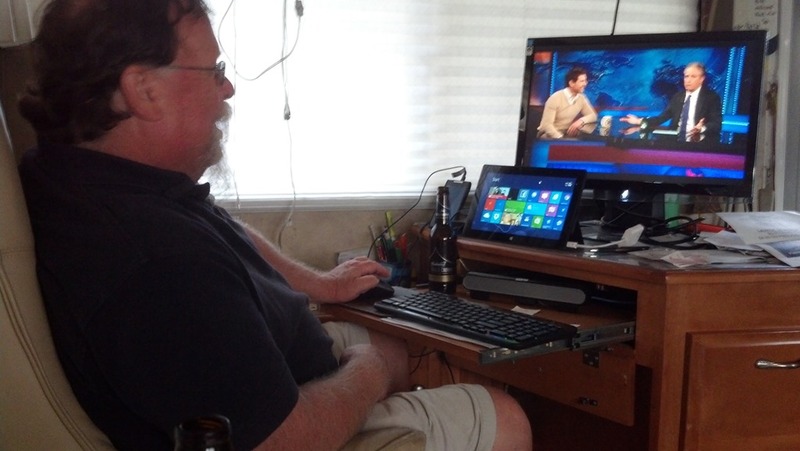 When I want to take my computer with me, I just unplug the monitor and hub, snap in the keyboard/cover, and I am on my way with everything I need. It is now my full time computer. My Internet connection is usually provided by my Droid RAZR smart phone running the FoxFi hotspot app. The Surface Pro power supply has a handy USB charging plug built in. There is much more to learn. We have created a new Forum area just for Windows 8. Anyone can read the Forums, you need to be a Geeks On Tour member to post a question. We might be making some videos on Windows 8. We are definitely scheduled for a Windows 8 seminar at the Escapade in Gillette, WY on June 30-July 5. Meanwhile, we found this nice video on Youtube: The Missing Windows 8 Instructional Video. It’s 25 minutes and covers all the basics.